I like featuring yarn projects for a couple of reasons. Firstly, many of us also knit or crochet so it is another way to make jewelry AND do some yarn stash busting at the same time. Secondly, if you are willing to experiment with needle sizes, fine wire versions might be possible for some designs. 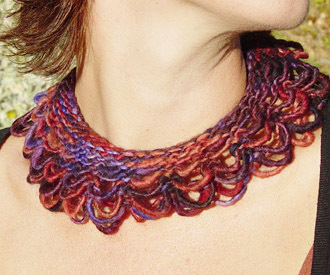 Hilary Engebretson's lovely lacey knitted collar tutorials will have you rummaging through your yarn stashes! She even provides the pattern for 2 different versions, a lightweight yarn one (above) and a heavier version (below). Lovely lacey collars ! would love to try out the first one ..... with little pearls at the bottom I think Would make a lovely bridal necklace . Thanks for sharing .